"In their newest book, Dennis L. Bolles and Darrel G. Hubbard add to their long years of contribution to the body of knowledge for PMOs, which started in 1997 with a first PMI Seminar on PMOs in Chicago developed and presented by Dennis. 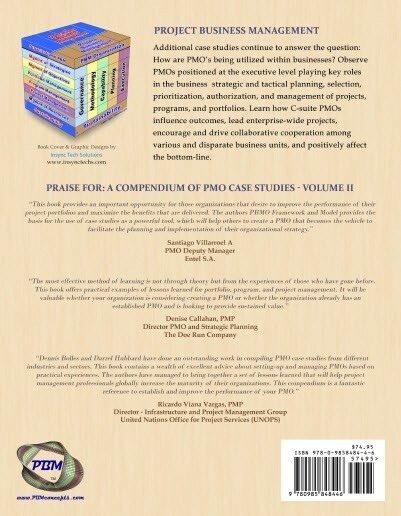 After setting the stage in the first section of this book, they move on to presenting their 2015 research and its summary results in Section II and III, delineating how PMOs have proven their ability to deliver a wide variety of projects. In Section IV, they document the core of this book, which contains eight real life PMOs of significant organizations like UNOPS, Mayo Clinic, and Doe Run. This book will enable readers to identify dependable practices in a structured way and to provide an excellent view of the current state of art in PMOs. A must read for consultants and managers who want to understand how to be successful with PMOs." 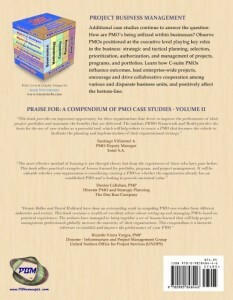 “A Compendium of PMO Case Studies – Volume II continues to provide a thorough analysis of functioning PMOs. The true benefit comes from reality rather than the pure theory espoused in most PMO books. The value for me was to apply other organizations lessons learned to our process improvement. Our Lean Organization saw this as a great value add as we were able to remove non-valued add steps from our process based on those case studies. This is a “must have” book for anyone thinking about establishing an enterprise PMO or making significant im­provements to their existing PMO. It clearly demonstrates that highly successful PMOs need not look the same, act the same, or be the same. Successful PMOs are as diverse as people are. I view this book as a cookbook for successful PMOs. Choose the type of PMO you are aspiring to become, follow the recipe, and see how you like it. If it does not meet your taste, try another recipe. This is a book you will want to have in your library.